Let’s hope Ash Williams can get his job back at Value Stop. Starz has cancelled the Ash Vs Evil Dead TV show after three seasons. According to reports, season three will run its course, and the third season finale episode, “The Mettle of Man,” will serve as the Ash Vs Evil Dead TV series finale. A Starz horror drama, Ash Vs Evil Dead stars Bruce Campbell, Lucy Lawless, Ray Santiago, Dana DeLorenzo, and B Arielle Carver-O’Neill. The gory series centers on Ash (Campbell) who is now Elk Grove, Michigan’s hometown hero. In season three, Ash finds his long-lost daughter, Brandy Barr (Carver-O’Neill), and naturally tangles with the Evil Dead. “Ash v Evil Dead has taken audiences on a wild ride for three seasons thanks to the fantastic performances and creative efforts of Sam, Bruce, Rob and the entire cast and crew. 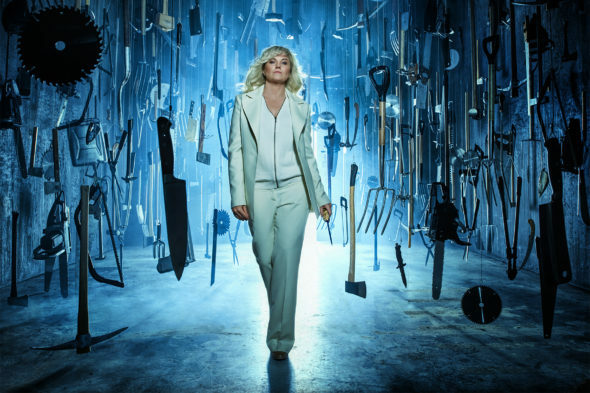 We are proud to send the show out with a bang…and a splat,” said Carmi Zlotnik, President of Programming for Starz. The third season of Ash Vs Evil Dead is averaging a 0.08 rating in the 18-49 demographic and 177,000 viewers. Compared to season two, that’s down by 52% and 42%, respectively. Learn how Ash Vs Evil Dead stacks up against other Starz TV shows. 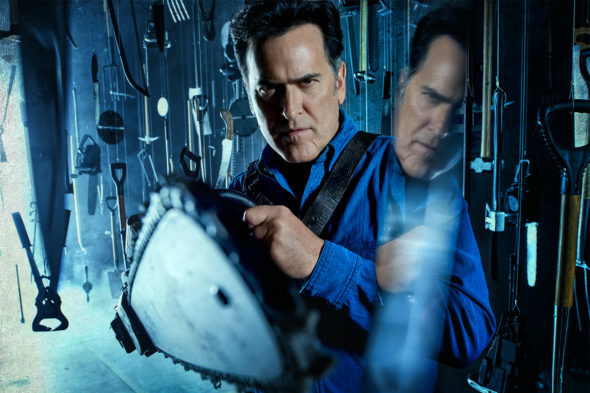 Star Bruce Campbell bid farewell to his “role of a lifetime.” Check it out. The official Ash Vs Evil Dead Twitter Account also confirmed the cancellation. What do you think? Are you a fan of the Ash Vs Evil Dead TV series? Is it ending at the right time? Had it been up to you, would Starz have cancelled or renewed this TV show for a fourth season? I cannot believe this! Love this show. As a previous person said, it’s a perfect blend of horror and comedy which is why I kept coming back. No accounting for the higher ups poor choices…. I hope it could be picked up by another network. I think Starz doesn’t have the huge viewership to keep any show relevant. I will miss it dearly. This Was one of the best shows ive ever seen!!!! I HATE Horror but this was perfect, not just scares you time to time but makes you laugh at the same time. They are wrong to cancel this show. the rating dont mean ****, someone could watch one episode and be like that was amazing and go and watch the entire series online which is what happend to me and my 3 friends that saw it together. Definitely their rating is wrong for this show, me and my son have been there for every show. We are devastated.. the show is great for great for the young and old! Ash leave this Starz **** and move to a decent one like Netflex. They appreciate a goid show . Please make the fourth season, i love this show !!!! 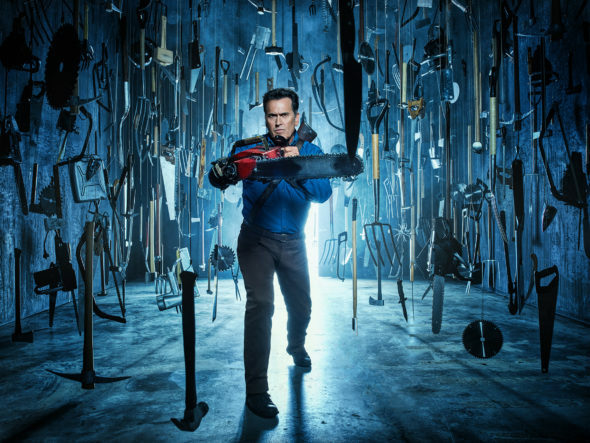 I really enjoy this mindless show & look foward to each episode of Ash vs Evil Dead….so much fun!! Today, 4/25/18, I just read that it has been cancelled. Please…Nexflix or Hulu….pick it up for another season!! the ratings must not be accurate, everyone i know loves this show. i really am sad to hear its been cancelled. i subscribe to Netflix, hopefully they will save us! I absolutely love this show and truly feel for Bruce that, once again, he’s had a great series pulled out from under him. Great decision, Starz….not. Nope. It actually already is a netflix coproduction with Starz. If netflix wanted to keep it, they wouldn’t have announced cancellation yet. A really stupid decision. Having the show on 3-4 times in the same night on multiple starz channels screws up any chance for an accurate rating of the show. The same thing could have happened to Counterpart, but starz gave it a 2 season run. It should have been on ONCE on Sunday and then again on Tuesday, and then whenever. The screw up is on Starz. Oh and couldn’t they add up those live viewings on All Starz and dvr? But you are the all knowing of TV ratings and they are so challenged with this like Keifer Sutherland said about his show recently.